NEOLITH has been awarded with the 2015 Architectural Product Innovation Award (PIA). The “Architectural Product Innovation Awards (PIAs)” from Architectural Products magazine, determine and honor the innovation in the development of commercial building-related products, ranging from cladding and surfacing to elevators. Judged by a group of 50 independent industry professionals, the award program aims to highlight the latest and greatest products available to builders, architects and designers. Once again, the Neolith product innovations have been recognized. 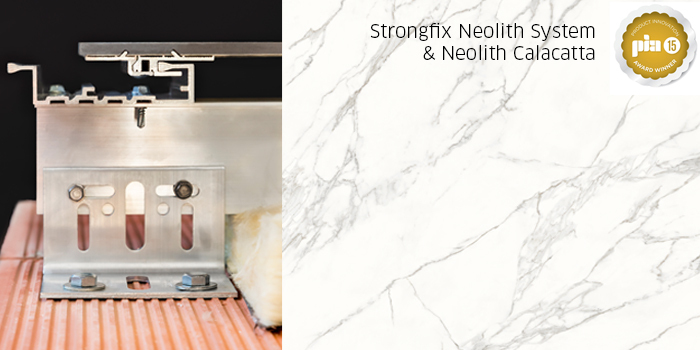 This time the Strongfix Neolith System and Neolith Calacatta has been awarded with the 2015 Product Innovation Award thanks to its revolutionary system, design and technical features. We are very proud and really excited to win this Award… We will keep working and innovating!